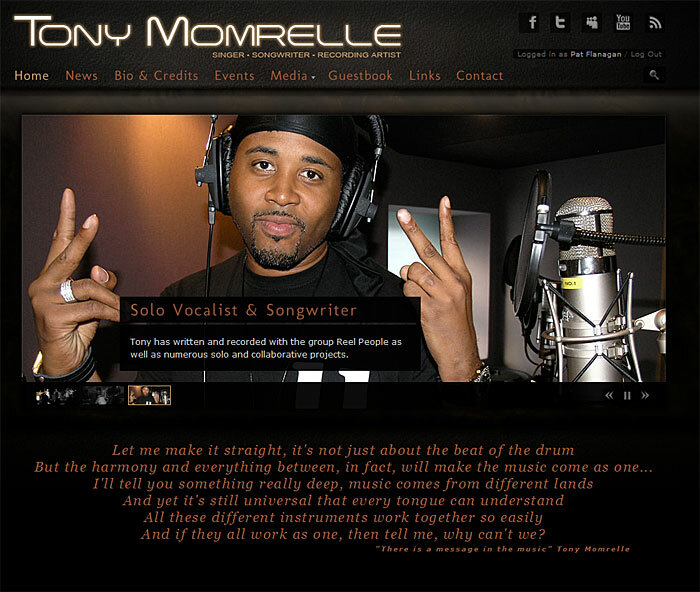 Tony Momrelle is a UK-based R&B/soul singer who has multiple projects: lead male singer with famous British Acid-Jazz band Incognito; recording and touring male singer with multi-platinum artist/band Sade; and partner in record label Reel People Music, in which he also contributes to multiple artists’ work. 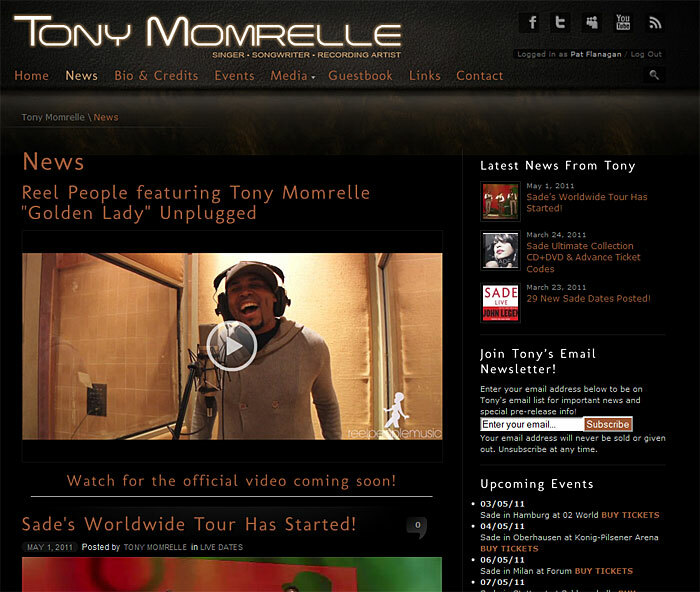 Tony needed an official website presence to inform existing fans about his live dates and recordings, and to build new fans by exposing them to his work through video and audio streams. Tony wanted a design that said “casual sophistication,” which would fit well with his personality and music. Full hosting and ongoing maintenance are provided for this website. Bi-Directional Social Media Integration: Blog posts can be broadcast instantly to client’s Twitter, and Facebook accounts, while posts made directly to those sites can be shown on the website itself. Facebook “Like” buttons integrated throughout site to encourage visitors to share on Facebook, resulting in increased incoming traffic and incoming links. Mobile Version: A fully functional mobile version of the website is accessible with special compatibility included for iPhone and iPad platforms. Persistant Music Player: A music player containing a playlist of 8 full songs (virtually unlimited capacity) loads at the top of the screen upon visiting the site. This plays uninterrupted as the visitor travels from page to page through the site, giving a fluid musical experience. The visitor has the option to stop the music, as well as pick other tunes by shuffling back and forth, or selecting from a popout playlist. 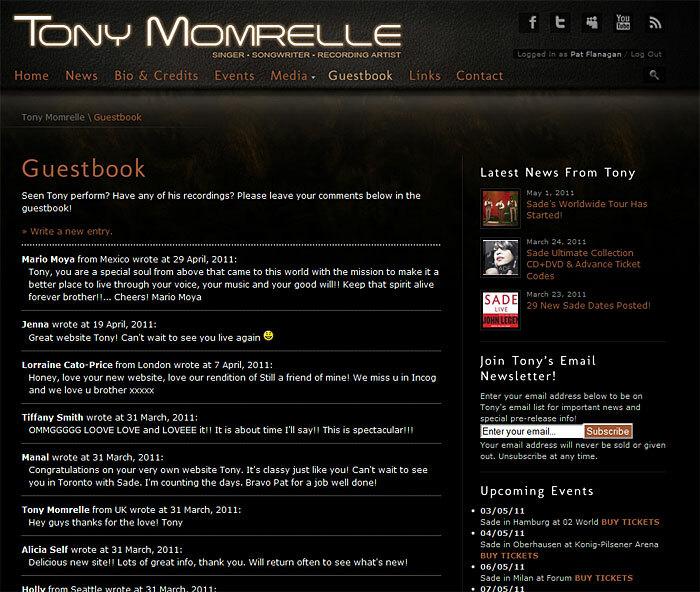 Bio And Credits: Tony’s biography is included, along with a selected credits discography including album cover artwork. 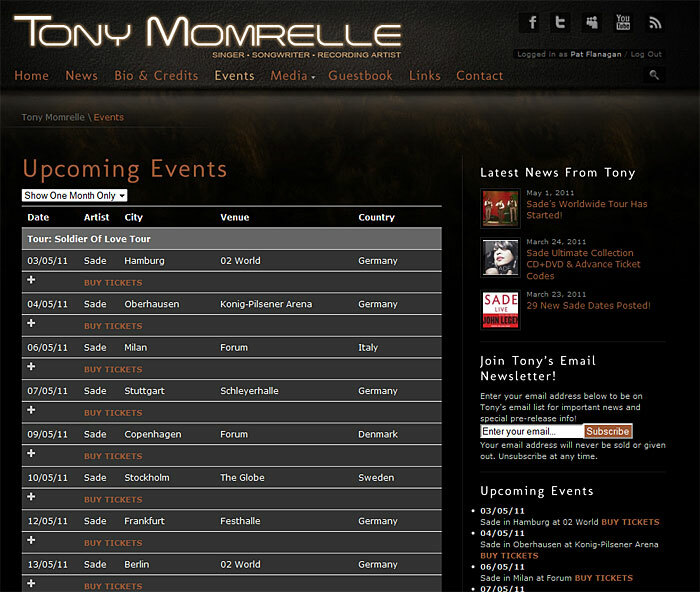 Live Events: Live events database included for reporting future and past concerts, able to list multiple bands and tours. All prior venue information easily accessible for quickly listing recurring shows. Video: Pop-up video player plays the user-selected video. Able to show unlimited videos, hosted either by YouTube or internal to the site. 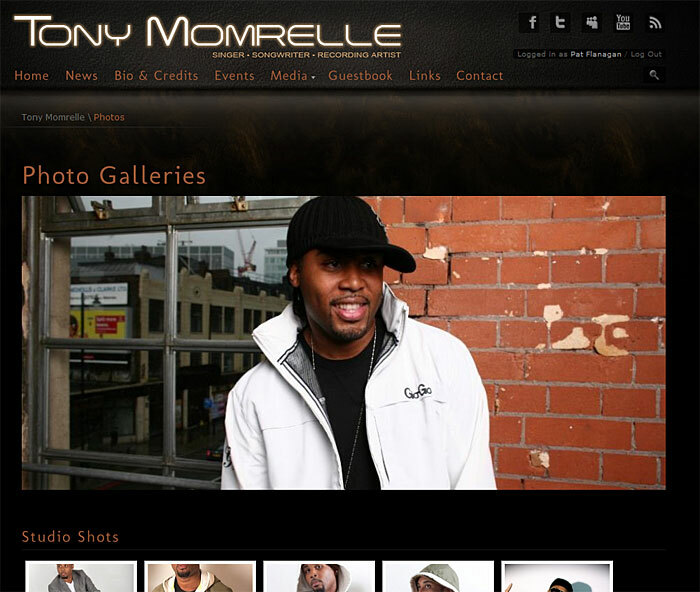 Photos: Multi-section photo gallery with automatic photo resizing, watermarking and thumbnailing, with “lightbox” fullsize photo display. 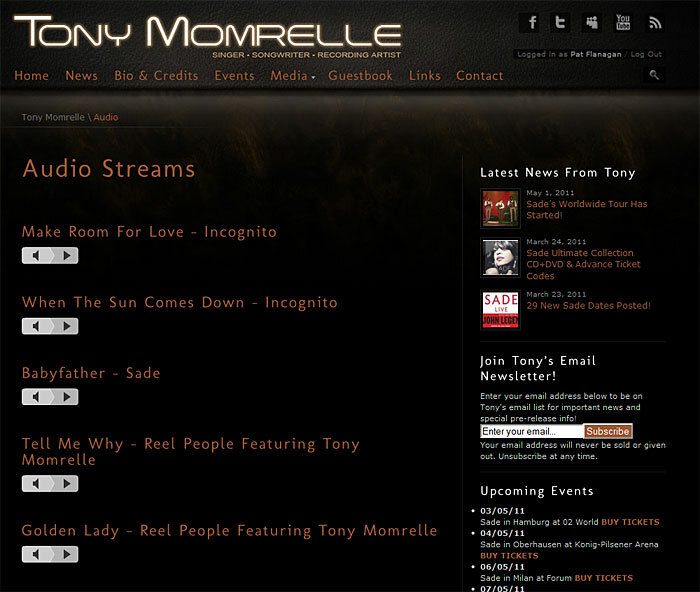 Audio: Streaming audio players play MP3 files without the ability for the website visitor to download them. 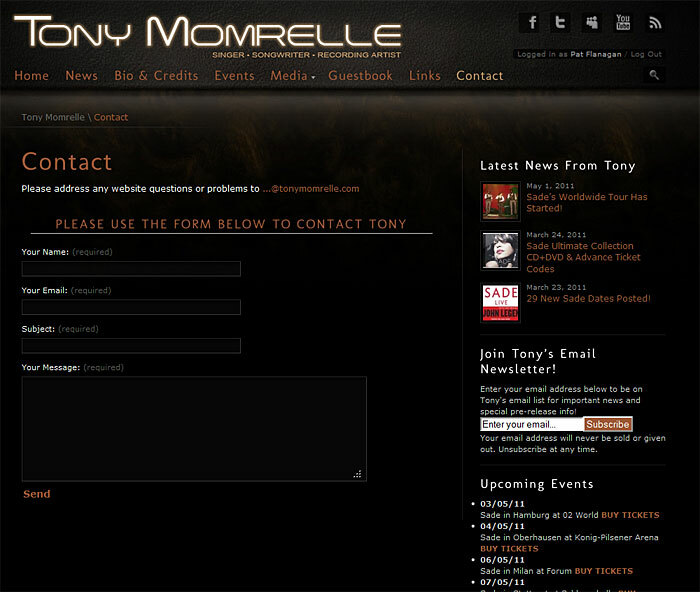 Guestbook: Website visitors are able to read other visitor’s comments, and can leave their own comments about Tony’s performances via a submission form. System is fully moderated — no comments go live until they are approved. Email Newsletter: Website visitors can join an email list to receive occasional important bulletins. This is a double opt-in email newsletter complying with all US regulations, maintained internally with no outside expense. 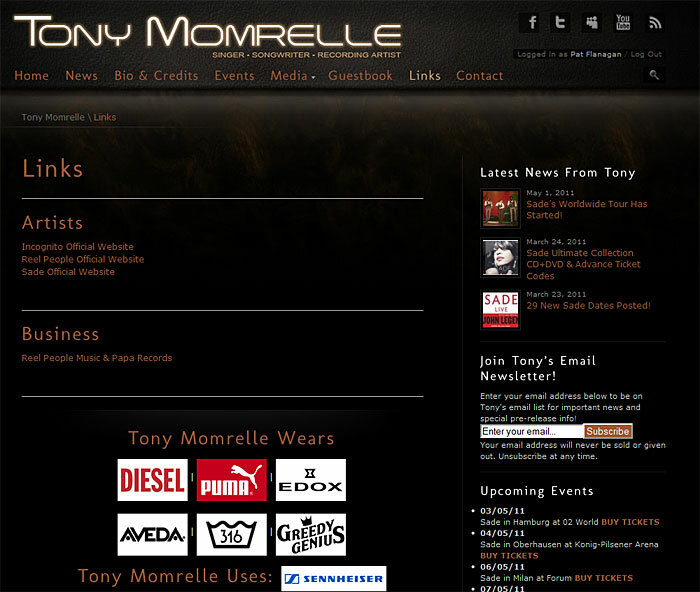 Click here to visit TonyMomrelle.com!